Photo credit to Mark Sheldon and Tony Smith. The polymathic Douglas R. Ewart has been honored for his work as a composer, improvising multi-instrumentalist, conceptual artist, sculptor and mask- and instrument designer. Also an educator, Ewart bridges his kaleidoscopic activities with a vision that opposes today’s divided world by culture-fusing works that aim to restore the wholeness of communities and of the individuals within them, and to emphasize the reality that the world is an interdependent entity. Born in Kingston, Jamaica, Ewart immigrated to Chicago, Illinois in 1963. There he studied with the master musicians of the Association for the Advancement of Creative Musicians—an organization he later served as chairman. He also studied music at VanderCook College of Music and electronic music Governors State University. 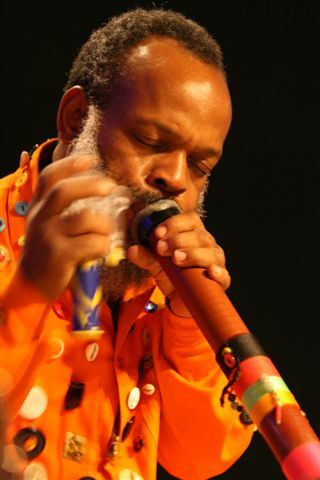 Ewart is the founder of Arawak Records, leader of the ensembles such as the Nyahbingi Drum Choir, Quasar, Clarinet Choir and Douglas R. Ewart & Inventions, and a designer and creator of instruments and kinetic sonic sculptures that have been exhibited in venues such as Houston’s Contemporary Arts Museum and the Museum of Science and Industry Chicago. “Crepuscule,” his vast periodic conceptual work, is collectively composed by scores of musicians, artists, dancers and activists. Ewart’s honors include a U.S. Japan Creative Arts Fellowship, a Bush Artists Fellowship, and an Outstanding Artist Award granted by a former Chicago Mayor. He is a Professor Emeritus at the School of the Arts Institute of Chicago.